The Anchor Hocking dinnerware company is best known for its vintage glass ware, such as Fire-King dishes, depression glassware and milk glass products. However, this company also produces modern dinnerware and kitchen products. The company has been in business since 1905. They are a United States based company who markets its products worldwide and employs over 1,500 people, which is great for the economy. This American-made dinnerware and kitchen products are a worthwhile investment. Modern dinnerware by made by Anchor Hocking includes several patterns of clear glass dinnerware including Cameron, Isabella, Presence, and Rio. 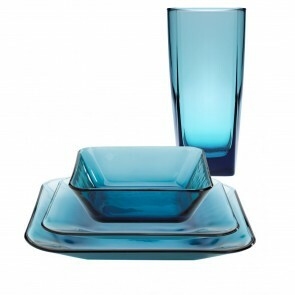 The Rio pattern is also available in coastal blue glass, which is gorgeous pattern of colored glass dinnerware. The Isabella pattern also features crème-colored ceramic dishes that are very attractive. The best thing about the Anchor Hocking products, in my view, is that they are American made. Considering all of the dinnerware that is available in our country, few are made in America. Patriots will appreciate that. Occasionally, the company distributes dishes where all or part of the items are foreign-made, but they are careful to disclose when things are specifically made in the USA. Anchor Hocking manufactures many products that are ideal for your kitchen or dining room. These include dinnerware, serveware, glassware, storage containers, bakeware, and cookware. When browsing current products and vintage items made by Anchor Hocking, I was amazed to find that much of my collection of glassware was actually made by this company. These include soda fountain glasses that I have always used to serve milkshakes and banana split parfaits. This set was given to me by an elderly lady who was our neighbor back in the 70s. I used to stop and visit her on my way home from school and she often serves treats in these glasses. I also have a set of crystal goblets in the Wexford pattern which was made by Anchor Hocking from 1967 to 1998. My mother gave these to me when I first got my own home. I have had them for years but didn't know that they were Anchor Hocking glassware. 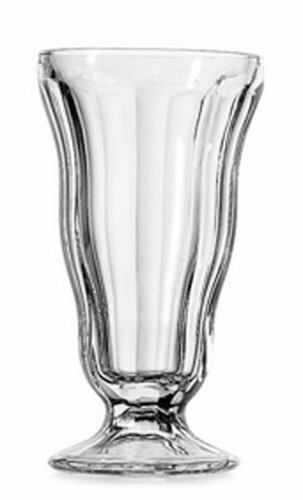 I love the Wexford pattern and have decided to get some tumblers, a pitcher and serveware to match my goblets. The glass is very durable, nothing like modern-day everyday glasses. I was kind of worried about using crystal glasses because of the current buzz about lead-based products. But after studying up on it a bit, I am totally comfortable using crystal for serving, but will take caution not to store liquids in crystal dishes. Anchor Hocking also makes cookware, bake ware and storage containers that is phenomenal. The design is practical and useful in the kitchen. 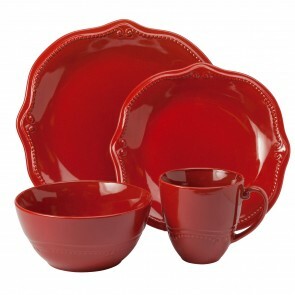 These include pie plates, casserole dishes, bake and store dishes, and so forth. I was amazed to find that much of everyday kitchen products were made by Anchor Hocking. Evidently, I'm naturally attracted to their style of kitchenware, because I bought the products because I like them, not because I was looking for Anchor Hocking dinnerware and kitchenware. It makes me feel good to know that these products are made in the USA. 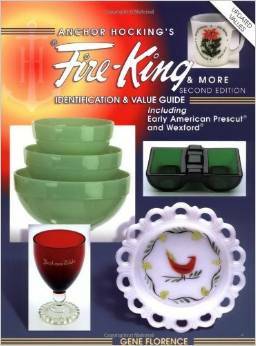 Vintage dinnerware by Anchor Hocking includes depression glass, milk glass, and the famous Fire-King brand. To learn more about collectible Anchor Hocking dinnerware, I suggest consulting a collector's guide.